Something’s rotten in the state of Texas, and it’s not the smell of all the people they’ve executed today. 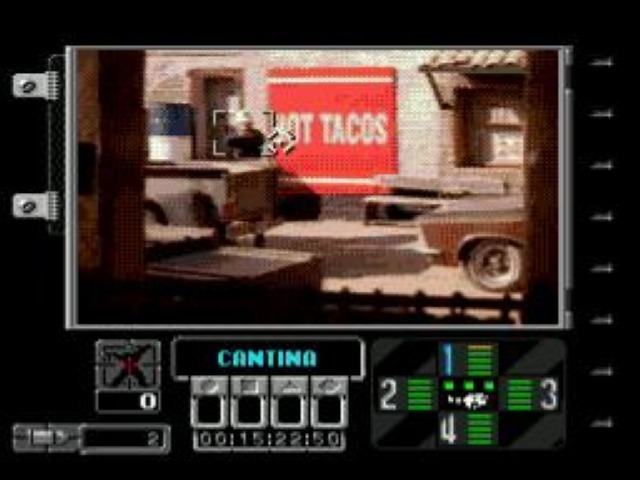 No, this particular stench comes from this game, where shape-shifting alien invaders are slowly taking over a sleepy little town on the Mexican border. The military knows exactly what’s going on, but seems completely powerless to stop them. They come up with a covert solution instead. You play as a weapons operative operating a high-tech surveillance system wired in throughout the town. You and that system are the last line of defense before things get all atomic. Fail, and the town gets destroyed – either by the aliens or a government-issue nuclear bomb. Succeed and you’ll get a shot at the alien mothership and save the day. So goes the plot in Ground Zero Texas, another interactive movie offering for your Sega CD, because there certainly aren’t enough of those. Don’t get me wrong, the Sega CD was a great technical innovation. But do you ever get the feeling that developers didn’t really know what to do with it? It’s like they all had meetings and said “Hey, we’ve got this neat little disc that will store a metric shitload of video on it – what can we make a movie out of that could possibly have some kind of gamey element to it?” Only a handful of developers actually chose to dodge this “movie first, game second” mentality and used the storage space to make better Genesis games – and I’m not talking about the overdone re-releases of old titles with new CD sound. I’m talking about a game like Lunar or Snatcher that used the space to make an expansive world and epic storyline. The rest, like Digital Pictures and Sony Imagesoft, just seemed to sell a video with a weak interactive element tacked on. This is one of those cardboard-cutout plots with trite shooting gallery sections that make up the gameplay. 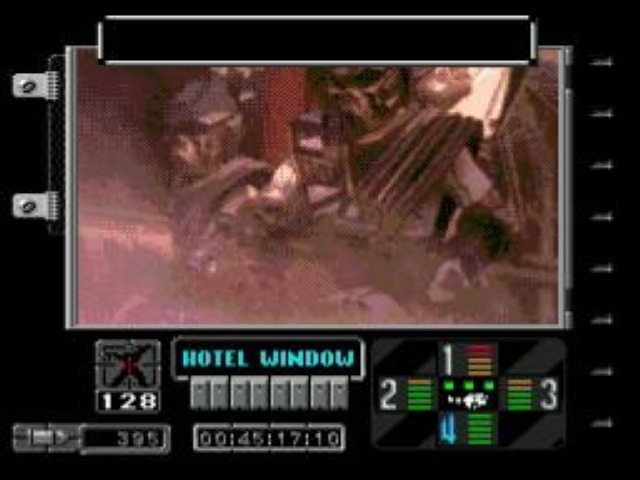 It’s essentially Night Trap with guns – you have four cameras placed around the town and your job is to monitor alien activity and shoot the bad guys when they reveal themselves. Between these sections are looped video clips where you must defend your cameras from attacks by the aliens. The plot has holes the size of… well… Texas, and the shooting gallery sections quickly grow tiresome. There is a small element of strategy involved. By default, the video feeds will show short loops of absolutely nothing – like the side of a wall, or the town plaza. You can switch to any camera at any time, you just won’t see any action. Cameras will flash when an event other than the “default” loop is taking place, and the video starts playing whether you respond or not. Flashing events are always important in the sense that someone will always get hurt or you’ll get shot at by the end of the segment. This means that a camera can take damage while you’re not watching it, or you could miss saving a civilian or one of your operatives. This will have an impact on the game. If you don’t save an operative, you’ll miss a vital part of a code required to continue the plot. Miss a civvie, and they may actually return later as an alien. These events can either be a standard shooting gallery, with numerous aliens popping up from hiding to blast you, or a video segment of something going on in town that usually ends in an alien pulling a gun and taking a potshot at you. Later in the game, multiple events will be going on at once and you’ll be forced to decide which are most important, or try and juggle between them all. If you can keep your cameras alive, and more importantly, choose to keep playing, alien stormtroopers will ransack the town. You’ll be treated to videos of them riding on trucks, shooting laser guns, and lobbing dynamite into the buildings. At least the game has a budget, so you’re going to see real explosions, aliens that explode into parts and gack, and decent optical effects for the lasers. Still, it’s just an excuse to shake up the environments and types of baddies that you will be blasting. You’re still running between four cameras, doing exactly the same thing at a much more frantic pace. And frantic is not something the controls support. Ground Zero shows the usual pixelation, but unless you really are set on having crisp visuals, it’s forgivable here. You’re able to understand everything and see reasonable detail, so the video is passable. You may not see a great level of detail in the shooting sections, where enemies are distant and hiding behind objects, but you’ll always be able to spot motion, and frequently the shadow of someone about to pop out. Even if you can’t do either of those two, the targeting brackets will make it clear who needs shooting – especially in the scenes where an alien breaks its civilian cover and pulls a gun. The brackets will always tell you which guy is the bad guy. The sound is properly matched with the visuals, and there are plenty of CD-quality alien noises and gunshots. The game even exhibits some randomization, mostly in the order that clips and pop-up bad guys are shown, and keeps good track of who has been abducted and what aliens have gotten away from you. Technically, it’s all there except for the unbearable aiming controls. The plot has you repetitively shooting aliens until you’re bored of it or overwhelmed, and the controls add the killing blow by making the shooting frustrating and unenjoyable. The simplest way to sum this up is by saying that on the technical side, this is one of the better interactive movies for the Sega CD. On the gameplay side, it’s one of the worst. It does try to give a little more life to the “shooting gallery” genre, and the budget does allow for some indie-film level action. The plot is pure camp, and unfortunately, won’t keep you staying for more. If you can’t bear the controls and the shooting sections, you’re not really going to give a good two fucks about seeing this one through to the end. The presentation and randomization seem to work. Horrible aiming control in a game where all you do is shoot things.